We have wanted chickens for a long time and now we have six! 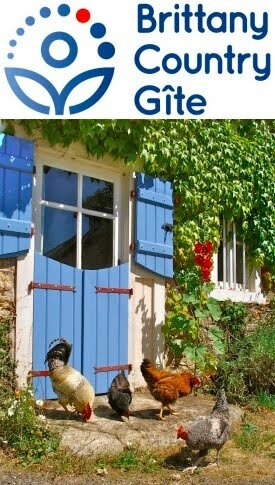 The shell of an old hen house or ‘poulailler’ was already here in the garden and we worked hard to make it fully functional. The first two chickens came from a friend who lives locally and we added four younger chicks from a local farm that also sells geese and ducks. 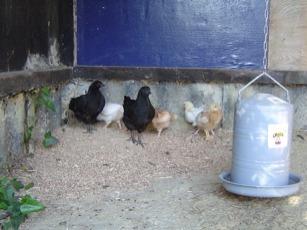 The new chicks are about 6 weeks whilst our other black hens are about 10 weeks, so we have a way to go with them before we can expect any eggs. This should start to happen when they are about 20 weeks so we shall keep you posted. We want them to eat our slugs and snails but unfortunately they don’t seem very interested in these at the moment! We certainly hope they develop a taste for them, as they grow older. We started naming them but have run into two problems. The first is that everyone says that we shouldn’t name them if we intend to eat them and the second is that because they are growing and changing it is becoming more difficult to tell them apart and remember who is who! It wasn’t that easy adding new chicks in with existing hens even though they are only weeks apart in age. There was a bit of ‘handbags in the hen house’, the older ones did peck at the youngsters and we found ourselves sitting in with them to prevent any damage! After only a couple of days they have settled down but we know now for sure that we would have to separate younger from older hens and be careful when introducing new stock to old. This is simple stuff but one really has to do it to learn it. I am sure there are many of you who have much more experience with hens and we would be very happy to receive advice.